Whether a Notary Journal or record book is required by your state or not, we recommend you keep one so you can keep a detailed record of all documents you have notarized. A Notary Journal is a great tool to record details of all items notarized in the event a notarized document is lost, altered, or is challenged in court. Our Notary Journals, also known as notary public record books, are bound and sure to give you that extra touch of professionalism. It is always wise to keep a record of all documents you have notarized. In the event that you are audited, all of your transactions are in one neat place. 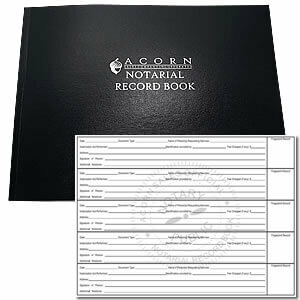 With a durable cover, the pages of this notary record book provide ample room to document all information a notary may need. Stock item that can be shipped within 24 hours of ordering - if not sooner!